Once bananas start to turn brown, they never really seem to get eaten. For that reason, I’m always looking for new recipes that use bananas. 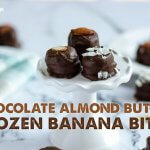 I have found a few recipes that I really enjoy such as a coconut flour banana bread recipe, these homemade granola bars, and this chocolate almond butter banana ice cream bites recipe. They’re cold, creamy, and naturally sweet — a perfect treat for a hot day! What are Banana Ice Cream Bites? You may be familiar with banana ice cream recipes where you blend frozen bananas to make an ice cream. What’s different about this recipe is that you don’t have to blend the bananas at all. Using slices of bananas you can still get the same naturally sweet and creamy “ice cream” but in a bite sized piece. 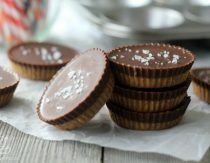 These are perfect for a crowd since they are already portioned and everyone loves them. This recipe is a great basis for your own creations too. Add whatever toppings you want before dipping in chocolate. Some ideas are nuts, coconut, and dried fruit. You can also add toppings after the banana ice cream bites are dipped in chocolate. Regular ice cream can be healthy when it’s homemade because it contains healthy brain boosting fats. But there are some other health benefits to this chocolate almond butter banana ice cream recipe. Bananas are also a good source of carbohydrates and fiber. Bananas even contain some protein. 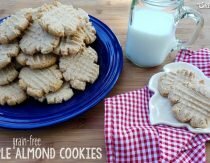 Almonds and almond butter are best when they are soaked and then dried. Soaking helps reduce enzyme inhibitors and improves nutrient bioavailability. Some chocolate chips contain ingredients we don’t want anywhere near ourselves or our kids. But if you find the right chocolate chips (or make them yourself) they can be a healthy dessert. Chocolate contains magnesium which many of us are deficient in. It’s also a decent source of antioxidants. Additionally, chocolate can have positive effects on the brain. Chocolate increases serotonin in the brain. Serotonin is a neurotransmitter responsible for better mood, sleep, and reduction of anxiety. Strawberry Coconut Milk Ice Cream – This recipe is dairy free and perfect for using up seasonal strawberries. Chocolate Coconut Clusters – A perfect dessert for coconut lovers! Chocolate Covered Bacon – Sweet, salty, and surprisingly delicious! Chocolate Truffles – Creamy, sweet, and delicious, these truffles are a great gift idea (or eat them yourself!). Coconut Cream – This snack is great spread on apple slices, pancakes, or eaten on its own. Homemade Mint Ice Cream – Mint and chocolate chips, a perfect combo. I’m excited to try this recipe next! Creamy, sweet, and decadent, this treat is perfect for kids of all ages. In a double boiler, melt chocolate chips. If you don't have a double boiler, simply place a tempered glass bowl over a pan with a small amount of water in the bottom and heat, stirring occasionally until the chocolate is melted. Spread a layer of almond butter or jam on half of the banana slices. Place the remaining banana slices on top of the buttered/jammed slices. Use a fork to dip each banana sandwich into the melted chocolate, allowing the excess to drip off before placing on a parchment lined baking sheet. Freeze 3-4 hours before eating straight from the freezer! 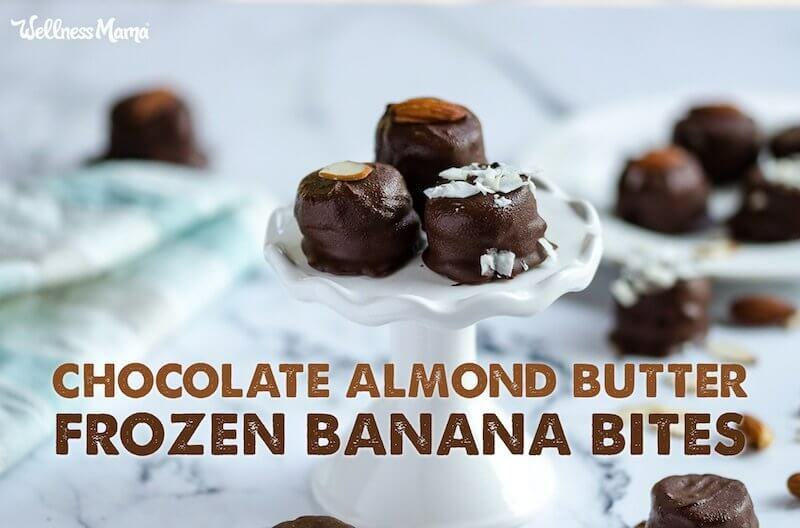 Try sprinkling chopped nuts or coconut flakes on top of the chocolate dipped bananas before freezing. Do you ever freeze bananas? What do you do with them? These sound yummy…will try them out. What I usually make are banana slices with chocolate (melt a bar of endangered species dark chocolate w/almonds and sea salt) and shredded coconut (Let’s do Organic, 100% organic coconut) sprinkle a bit on top of each while chocolate is still melted. On some I add Cacao Nibs (Navitas, organic) I kind of make a variety pack, some have extra almonds or perhaps a pecan stuck on top of the coconut. Put em on a cookie sheet and freeze. They make a great cold snack to pick on.